* From the Dipartimento di studi glotto-antropologici, Universitá degli Studi di Roma. The research on which this paper is based was carried out in the framework of a micro-project supported by FAO/DFIDs "Livelihoods Support Programme" (Sub-programme: "Livelihoods Diversification and Enterprise Development"). Disclaimer: "This paper was prepared under contract with the Food and Agriculture Organization of the United Nations (FAO). The positions and opinions presented are those of the author alone, and are not intended to represent the views of FAO"
In order to strengthen the capacity of SPFS-Guatemala to incorporate livelihoods analysis in the systematization of "good practices", an action-research exercise was carried out in November to December 2004, which focused on maize and bean certified seed multiplication in one project site. This paper describes the overall vulnerability context and the processes of change to which the participants and the indirect beneficiaries of seed multiplication are exposed in that particular location. The changes in household livelihoods that might be associated with the adoption of seed multiplication activities are documented here. The paper explores the economic and cultural logic that has facilitated the incorporation of this "good practice" into the participants livelihood strategies. 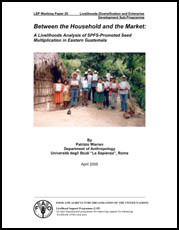 Finally, it illustrates the livelihood outcomes of seed multiplication in 2004 and suggests some measures that could lead to the scaling-up of these activities from household livelihood diversification to fully-fledged rural enterprise development. The Livelihood Support Programme (LSP) evolved from the belief that FAO could have a greater impact on reducing poverty and food insecurity, if its wealth of talent and experience were integrated into a more flexible and demand-responsive team approach. The LSP works through teams of FAO staff members, who are attracted to specific themes being worked on in a sustainable livelihoods context. These cross-departmental and cross-disciplinary teams act to integrate sustainable livelihoods principles in FAOs work, at headquarters and in the field. These approaches build on experiences within FAO and other development agencies. The programme is functioning as a testing ground for both team approaches and sustainable livelihoods principles. More information on the LSP is to be found on the last page of this document. a. To appraise inhibiting and enabling factors, and approaches supporting livelihoods diversification and enterprise development. b. To catalyze and facilitate innovative practices for supporting livelihoods diversification. c. To increase inter-disciplinarity and learning in FAO and partner agencies for supporting livelihoods diversification and enterprise development. The LDED will add value to FAOs regular programme and projects with a particular focus on addressing obstacles and promoting opportunities for people. It will capitalize on existing FAO strengths related to LDED in addition to identifying and addressing gaps related to livelihoods diversification and enterprise development.